The first public autopsy took place 8. 6. 1600 and made it to Jan Jesenus. An autopsy of the body of an executed man was held in the festively decorated Rejčkově college in June 1600, it lasted five days and watching as it was attended by about 5000 people. 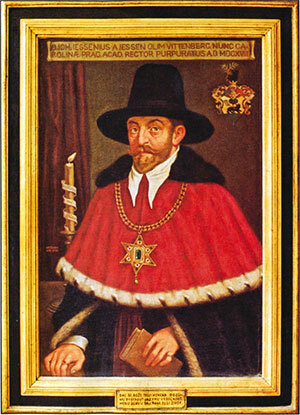 Jan Jesenius was born in 1566 in Wroclaw. He studied medicine in Wittenberg and in Padua. He focused on anatomy and surgery. He has published a wide range of surgical work and the personal physician of Emperor Rudolph II. and Matthias. Later, he became rector and chancellor of Charles University in Prague. Jan Jesenius first public autopsy conducted and thus contribute significantly to the development of anatomy. In the file for Anatomy sua et actio ad spectandum indicatio explained the importance of autopsies in terms of anatomical knowledge against opponents of the Church. An autopsy of the body of an executed man was held in the festively decorated Rejčkově college in June 1600, it lasted five days and watching as it was attended by about 5000 people. Jeseniovi assisted famous Prague Zalužanská doctor. The public autopsy aroused general sensation and historic awareness remains today. Two years later, Jan Jesenius becomes the personal physician of Rudolf II. and then his brother Matthias. In autumn 1617 he was elected rector, but more than the science to politics, which proved fateful.